In late October of 1779, the commander of the British fort at Michilimackinac, Lieutenant Governor Patrick Sinclair, sent the sloop HMS Felicity on a voyage to circumnavigate Lake Michigan. Felicity had been built in 1773 or 1774 in Detroit for the trader John Askin, but taken over in late 1778 by the Provincial Marine, the arm of the British Navy responsible for patrolling the Great Lakes, St. Lawrence River and Lake Champlain. Captain Samuel Robertson commanded the 45-ton sloop, armed with four 3-foot swivel guns, and her crew of eight during the voyage. 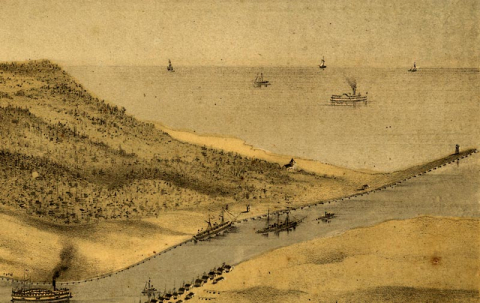 In the first week of November Felicity became the first ship to sail to the mouth of the Grand River at what would become Grand Haven. French fur traders had established an outpost adjacent to the channel because the river, which flowed 2/3rds of the way across the lower peninsula of Michigan, was an important trade route for them and local Native Americans. By the early 1830's twenty trading posts had been established by trapper and trader Rix Robinson along the southeastern shore of Lake Michigan. Robinson was employed by the American Fur Company, and had used the opportunity to acquire land in the area that would become Grand Haven. In 1834 William Montague Ferry, a Christian missionary from Mackinac Island, his family and some followers became the first permanent non-native settlers when they stepped ashore near Robinson's trading post. By the spring of 1835 they had purchased land from Robinson, built permanent lodgings and a sawmill. 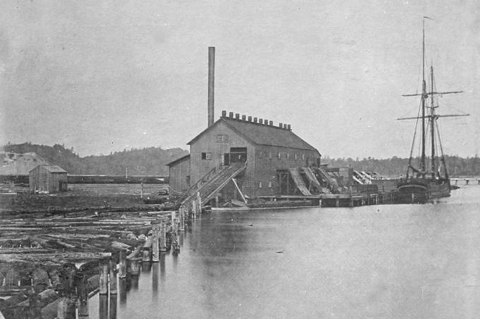 Soon after Grand Haven became a significant port in the booming lumber industry. 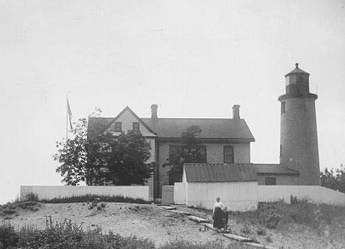 Congress appropriated money for a lighthouse at the mouth of the Grand River in 1837. An acre of land was purchased on the south side of the channel beside the lake and construction began the next year. Little is known about the precise design of the first main lighthouse at Grand Haven, except that it was built from stone quarried in Green Bay, Wisconsin. The first lightkeeper appears on government payrolls at the end of August 1839, and it is likely the light began operation within days. Though the lighthouse was built near the back of the property, erosion of the sand at its foundation by water and wind almost immediately put the lighthouse in danger of being undermined. A timber wall was quickly constructed to minimize erosion. But in mid-December of 1852 a major storm sent waves crashing well up the beach and the timber wall disintegrated allowing waves to sweep right up to the foundation of the lighthouse. By 4pm on December 18th the light tower had collapsed. In 1853 title was obtained for a new site on a sand bluff high above lake level and further inland from the water's edge. 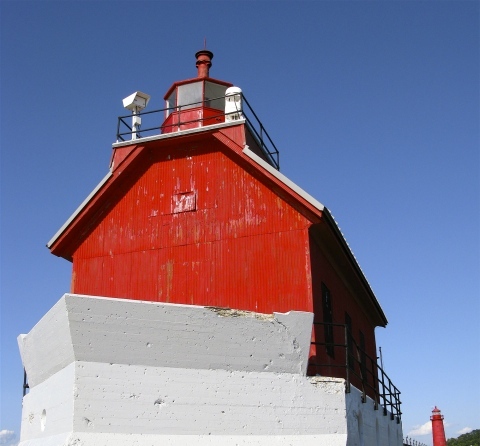 At the same time, light stations were being built at Point Betsey and Beaver Island Harbor, so it was decided the new Grand Haven light would use the same construction plans. Materials were delivered the following year and construction was completed in 1855. With the additional elevation on the bluff, and the fourth-order fresnel lens light placed 20 feet up in the tower, the flashing signal could now be seen 14 miles out on the lake in clear weather. A wood-framed fog bell building was also constructed on the original acre of land near the site of the collapsed light. and the fog signal building near the channel. Since Congress would not appropriate money for additional harbor improvement, the Detroit and Milwaukee Railroad began construction of a pier on the south side of the river in 1859. The new pier served to protect the cross-lake ferries that the railroad operated from their Grand Haven terminus. 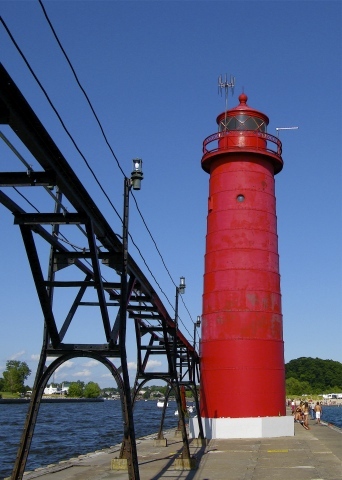 The railroad also erected a small beacon near the end, thus beginning the history of pier lights at Grand Haven. Eventually the government was obliged to take over maintenance and improvement of the pier and its lights from private hands. With the pier lights in operation, the utility of the main light came into question. In the early 1900's, the dwelling was remodeled to increase housing for the light keepers, but the tower was torn down. In 1956, after automation of the pier lights, the dwelling was sold into private hands. 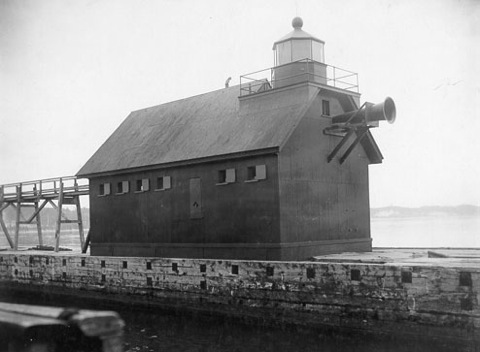 Improvements to the pier allowed the fog signal to be moved out from the shoreline and a beacon was constructed at the end of the gable. By 1922 the effects of weather on the wood-framed fog signal building required that it be sheathed over in corrugated iron sheets. before the diaphone fog signal was removed. Over the years the fog signal building/front range light was moved further out into the lake as the pier was extended, the wooden catwalk that allowed servicing during storms was also replaced with cast iron in 1922, the wooden pier facing was changed to sheet metal in 1954, and the diaphone fog signal was replaced with a whistle in 1969. The outer light now stands 1,100 feet from the beach, while the pier ends 50 feet further out. The need for the ships prow buttress to protect the building is evidenced by the pitting and scars in the concrete caused by the action of waves and ice blocks during storms. 1907 saw the erection of the current 51-foot steel cylindrical tower to serve as the rear range light. 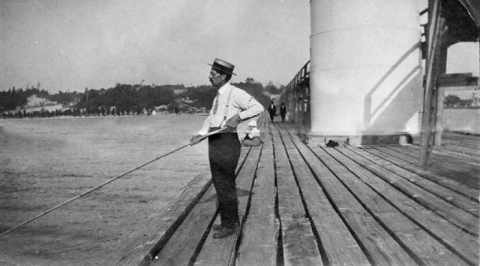 In addition to protecting the harbor, many Michiganders have enjoyed fishing from the piers at Grand Haven since they were first constructed. Access to the south pier is available from Grand Haven State Park and the adjacent Lighthouse Connector Park run by the city. Strolling the pier at Grand Haven is a popular pastime all year long. The lights can also be viewed from the surrounding ice during cold winter months, however care must be taken to ensure the ice is thick and stable enough for safety. Lake Michigan ice may become unstable in a strong offshore breeze. 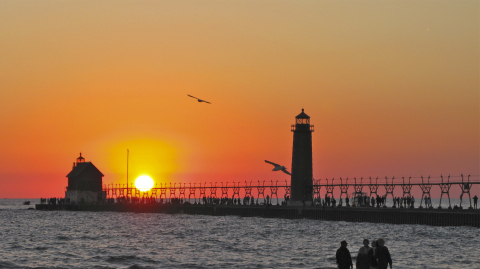 In 2009 the Coast Guard determined that the Grand Haven pier lights were no longer needed and offered them at no cost to entities that could maintain them in the future. In December 2012 the lights were given to the City of Grand Haven and the Grand Haven Lights Conservancy will maintain them going forward. 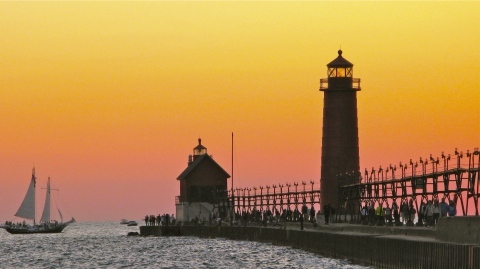 The Grand Haven pier lights should remain a popular local attraction and a beacon to recreational boaters well into the 21st century. The original Fresnel lens installed in 1855 can be seen at the Tri-Cities Historical Museum.